Back in 1988 we saw the return of The Egg who wears boxing gloves. Dizzy. 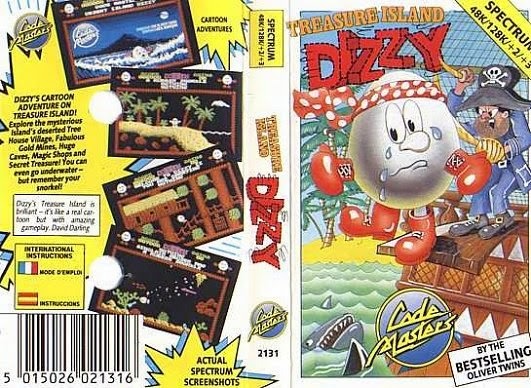 His initial game came out the year before but Treasure Island Dizzy turned everything up to 11. It had a proper masked sprite system as opposed to the XOR rendering of the original and it had a 128k soundtrack by the ever wonderful David Whittaker. He included a 48k soundtrack for those with older spectrums but the 128k version was the best by far. It also gave us in-game music. Music who's pleasant jaunty tones concealed any malevolence within. Treasure Island Dizzy was much in the same vein as it's predecessor, a flip screen adventure game with inventory puzzles and platforming. Very simple game-play. Move, Jump and collect/use. Original Dizzy only allowed the player to carry a single item, which must be dropped should the player want another item whereas Treasure Island Dizzy allowed for three items.. a design decision which would alter the gameplay and difficulty in ways they probably didn't foresee (..or did they?). Another decision they took was to remove the lives system used in the original whereas the player had 3 lives to start with but could collect more as the player progressed. This was removed and was replaced with Permadeath. They also removed the random flying enemies (see God Damned Bats trope ) from the original and replaced them with enemies which followed a specific and predictable path - if they moved at all. This made things a little easier. a little. Treasure Island Dizzy is very hard. I mean seriously really very hard. Don't underestimate this game. Kids today are not prepared for how soul crushingly hard this game is. Seriously! It's not hard in a dark souls way where you have to memorize attack patterns and weaknesses to succeed - no, Treasure Island Dizzy is harder than that. You see, in Dark Souls, should you die (and you will.. a lot) you don't have to start from the beginning again. With Treasure Island Dizzy, should you make any mistake - like fail to avoid one of the few traps, get hit by a creature, burned by fire, fall in water without a snorkel, or drop your snorkel while underwater while trying to pick up another item - Then it's back to the start of the game. No matter how far you have progressed. As you can see, there are items to collect, hidden coins which you need and the same puzzles to solve over and over and over again. It sounds terrible right? So why does this game invoke such fond memories with it's players? Well, for me it was initially the cuteness of the thing. The happy egg waving along with the jaunty tune, jumping and rolling. Dizzy was innocent. He was happy. Every time Dizzy died and I had to restart the game from scratch, it was my fault. Each and every time. There were no random actions, no traps that couldn't be avoided. With each death was a failure - My Failure. I don't like to fail so I persevered. I learned where items were. I made sure that my snorkel was always the most recent item in my inventory so that when I picked up an item under the water, I wouldn't drown. I timed the jumps, the rolls and even memorized the most optimal route through the story to get things done. After a lot of work, trial and error and a home made map, I finally got to the end screen. I had collected all 30 of the coins (some were hidden in evil places) and I completed the game. To be greeted by a message. CONGRATULATIONS! You have successfully solved all the puzzles and truely earned your freedom. Good luck Dizzy. I nearly had a psychotic breakdown.. after all of the work and retries the game was over with a simple message - then it was right back to the title screen again. "Welcome to Treasure Island Dizzy!" I sat in shocked silence watching the title screen for several seconds before I calmly put the tape back in its box and reset the computer. I never tried to complete it again. That was it.. I was done. But did I have fun? Yes. Absolutely. The feeling of solving a seemingly difficult problem and making progress was amazing. Making the jump to land on the top of the mine, jumping the crab and drowning the Sinclair Abuser magazine. Collecting some items and solving puzzles opened up new and interesting areas which really helped to sell the mystery of the island. Because there were no enemies trying to kill you generally, you were free to explore - just be careful. I do wonder whether it would be more fun if the permadeath was removed. Would the game still be fun if instead of a "Restart from the beginning" or "several lives" approach that a restart from a checkpoint system would be better. It would certainly be more forgiving. However restart-checkpoints didn't really come into existence until Sonic the Hedgehog and even Sonic had lives. This was the 80's/early 90's we had what we had and we had Dizzy and that was alright. I would recommend that anyone interested in game design and gameplay gives this little old gem a shot. It's got a lot of heart and is worth the time. Whether you want to devote enough time to complete the game will depend on several factors, one of which being your sanity. If anyone complains about how hard a modern game is, if you've played Treasure Island Dizzy, you can scoff at their ineptitude. Pah! You don't know hard until you've played Treasure Island Dizzy! I've placed a link at the top of the review so you can play it on-line. CodeMasters have not yet given permissions to reproduce any of their games online which is a shame because they'll be lost in time in a few years unless they're allowed to hosted by fans. For my mind, The Oliver Twins made the games which made CodeMasters a household name. I owned a great number of their games and enjoyed them all. They still make games as Blitz Games Studios - They have a simply staggering collection of titles to their name. To call them prolific would be an understatement.